As can be seen, only five sub-topics had more than one blog covering it. Of course, there are an infinite number of ways to categorize sub-topics, and I don’t claim to have addressed them other than as I described. 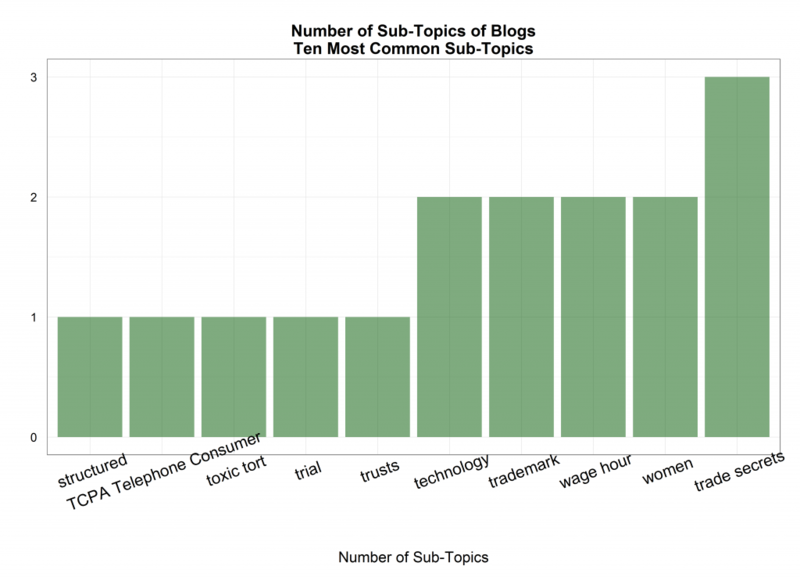 Still, this is one method to understand (and quantify) the blogging activities of large U.S. law firms. As a reminder, this series of posts draws on the blogging activities of the following U.S. large law firms: Adams and Reese; Archer & Greiner; Armstrong Teasdale; Baker & Daniels; Balch & Bingham; Bingham Greenebaum Doll; Boies, Schiller & Flexner; Brownstein Hyatt Farber Schreck; Burr & Forman; Butler, Snow, O’Mara, Stevens and Cannada; Cahill Gordon & Reindel; Carlton Fields; Chapman and Cutler; Clark Hill; Cole, Scott & Kissane; Dickinson Wright; Epstein Becker & Green; Faegre Baker Daniels; Fenwick & West; Fisher & Phillips; Foley Hoag; Fredrikson & Byron; Gardere Wynne Sewell; Gibbons; GrayRobinson; Honigman Miller Schwartz and Cohn; Ice Miller; Kelley Drye & Warren; Knobbe Martens Olson & Bear; Lathrop & Gage; Leonard Street; Loeb & Loeb; Lowenstein Sandler; Maynard, Cooper & Gale, McElroy, Deutsch, Mulvaney & Carpenter; Miles & Stockbridge; Miller Canfield; Moore & Van Allen; Morgan & Morgan; Parker Poe Adams & Bernstein; Phelps Dunbar; Porter Wright Morris & Arthur; Quintairos, Prieto, Wood & Boyer; Robins, Kaplan, Miller & Ciresi; Robinson & Cole; Roetzel & Andress; Saul Ewing; Shumaker, Loop & Kendrick; Shutts & Bowen; Steptoe & Johnson PLLC; Stinson Morrison Hecker; Stites & Harbison; Stradley Ronon Stevens & Young; Strasburger & Price; Stroock & Stroock & Lavan; Taft, Stettinius & Hollister; Thompson & Knight; Vedder Price; Wachtell, Lipton, Rosen & Katz; Warner Norcross & Judd; White and Williams; Wiley Rein; Williams & Connolly; Williams Mullen; and Winstead.